Scandinavian Bronze Age art features a number of motifs having to do with the movement of the sun through the heavens during the day and the underworld during the night. 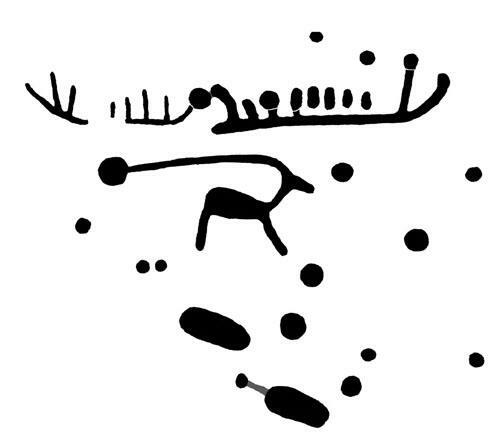 Here on Aard, we've previously seen a recently found sun-chariot rock carving, which most likely depicts a wheeled bronze model. But more commonly, there's a horse pulling the sun's disc across the sky without the benefit of wheels. 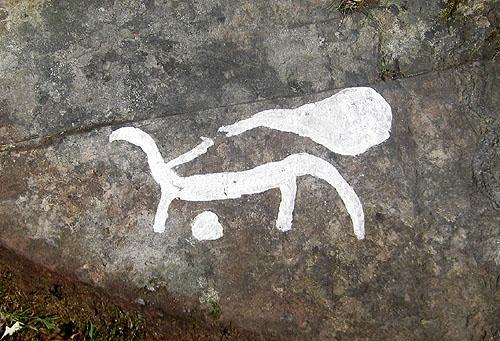 This motif is known from several rock art sites on Sweden's west coast. 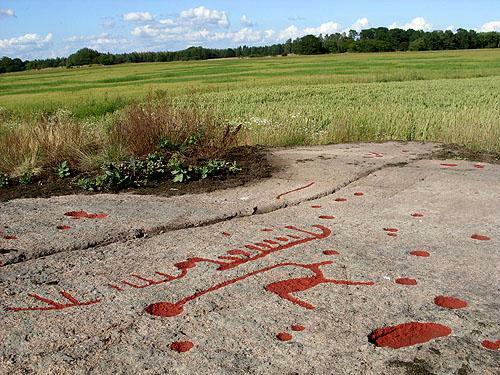 Awesome rock art surveying team Roger Wikell, Sven Gunnar Broström and Kenneth Ihrestam have recently found the first two sun horses on the east coast. One is at Gärstad near Linköping in Östergötland (above), the other at Uggelbo in Småland where Joakim Goldhahn's project is active (below). The three have a paper about the Gärstad find in Fornvännen's upcoming autumn issue! I'm not one of those knowledge relativists who claim that the archaeological source material is constructed by the preconceptions of archaeologists. But I think these horses are clear examples of how important it is to have Roger & Co's deep and wide knowledge of the iconography in order to find and identify the rarer motifs. A successful rock art surveyor does not just go around looking for scratches in the rock and filling them in mechanically with chalk. S/he needs to know what to look for. Several scholars had documented the Gärstad horse before without apparently reflecting on what the strange "antler" groove sticking out of the horse's head might be, nor noting that the groove extends all the way to the large cupmark representing the sun. It pays to return to the archaeological record with new knowledge.